Sitomic.com, a mobile marketing platform, now enables business owners to track effectiveness of their printed media, such as ads, brochures, and posters. Sitomic makes it easy to create mobile landing pages and launch QR code tracking campaigns to analyze visitor data across multiple publications. In the world where every bit of consumer information is valuable, the visible 20-30% of traffic can really help marketers optimize their print ad investments. Gathering visitor statistics from printed campaigns has always been a tricky business. 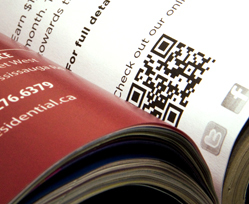 Thanks to QR codes, printed ads have now become easier to track. Sitomic.com enables business owners to easily launch multiple QR code campaigns for collecting visitor data from different sources. The logic behind print media tracking is simple. A unique QR code is generated for each type of advertisement, whether it’s a magazine feature, poster, or even a business card. Sitomic QR Code Manager instantly collects visitor scans from each location and organizes numbers in a comprehensive table for easy analytics. Business owners are then able to track potential return-on-investment (ROI) for each campaign. According to comScore, in December 2011, 1 in 5 smartphone owners in the US scanned a QR code with their phone. Which means that businesses can track roughly 20% of their ad traffic with QR codes. These stats can be further improved by including a shortened URL with each QR code, for example goto.co/mm24h. Many of those who will not scan a QR code will enter the URL into their browser. These numbers, too, will be added to visitor statistics. “In the world where every bit of consumer information is valuable, the visible 20-30% of traffic can really help marketers optimize their print ad investments,” said Dmitri Sennikov, Head of Business Development at Sitomic. Sitomic.com is a free resource to launch QR Code marketing print campaigns. The platform allows business owners to create professionally-designed mobile landing pages and launch QR Code tracking campaigns all in one go. Based out of Toronto, Canada Sitomic.com is currently working to release paid version optimized for Real Estate industry.